There has been much ado in recent years about university campuses, on one hand, preparing young men and women for a lifetime of indignities, litigation against perceived slights, and for entering the natural world and remaking it in whichever image is least threatening to any and all inhabitants. However, to believe academia’s benefactors, a thorough formal education prepares the young for success in an increasingly interdependent and complex world. But perhaps it is more the intellectual curiosity and personal drive that achieves success. If you would describe a man who had three years of formal education – between eight and eleven years of age – as being one of the most talented and impressive men in the world, would you be surprised if he were Benjamin Franklin? According to the Franklin Institute, this son of a candle maker, attended grammar school at eight years of age, because his father wanted him to become a preacher. And then with an additional two years of reading and writing at a second school, for financial reasons, he was unable to continue. (His mother was his widowed father’s second wife. Ben was the fifteenth of his father’s seventeen children.) Yet he spent the rest of his life learning on his own. His father may have wanted Benjamin to become a preacher, but would not let him become a sailor as Benjamin’s older brother never returned from the sea. Instead, Benjamin was apprenticed to his brother’s printing shop. A lifetime of accomplishment followed this thinker, printer, first Postmaster General of the United States, and inventor (among these, the lightning rod, a more efficient wood stove, a chair, and bifocals). Three hundred years after his birth, university collections contain Poor Richard’s Almanack, wisdom and insight he published for some twenty-five years. He also created a genre that fills bookstores to this very day. His autobiography, published after his death, became the first of this genre published. 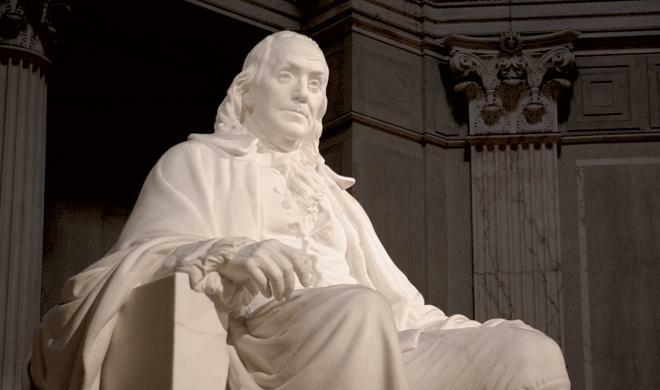 Benjamin Franklin is attributed to have said, “Early to bed and early to rise makes a man healthy, wealthy, and wise.” Advice, if followed by many young people in society today, might lead to fewer indiscretions. Not that young Mssr. Franklin would have been necessarily immune. One of his three children, was fathered before his lifelong relationship with Deborah Rogers  ( the “faithful friend”) . His illegitimate son – later the Crown governor of New Jersey – was raised by Ben and his common-law wife Deborah. About the dog: he was by accounts, a Newfoundland, name lost to history, that accompanied him during his years on assignment in the late 1770s in Paris, France. In the times in which he lived, in colonial America, and 18th Century Europe, dogs were gaining the affection of many, beyond hunting or working dogs. And in those times, politics, when conducted by statesmen of Franklin’s caliber, was an honorable profession. As for sage advice about “ready money”? What we might call “delayed gratification”, he would question whether it was truly a necessity in the first place. Laziness was more intolerable to Franklin, as this was time that cannot be reused. By being able pay one’s debts, diligently pursuing a trade and an honest profession leads to “ready money”. where did all the statesman go? Deborah Rogers was abandoned by her first husband who disappeared without leaving a writ of divorce. Unfortunately not all work can be learned while also making a living and, mostly fortunately, not all fields can be entered into without formal education. I think perhaps the best thing for anyone considering their future career is to have enough self awareness to know whether they will thrive within university environments and to have done enough research on the area they are interested in to know whether a degree is really needed to be involved in it. There are degrees in this world that aren’t worth the paper they are written on, and there are some fields where, as long as you have the willingness to do the footwork and a teachable, social disposition, you will do very well; Simultaneously, there are fields where no amount of footwork will get you in the door if you don’t have an expensive piece of paper held out in front of you. Benjamin Franklin was admirable, but different times call for different measures. That is the sad truth, isn’t it. There are professions in medicine, engineering, finance, and education where you cannot or would not be hired without those certificates or parchment. Learning online can enhance knowledge or ability one already has. It is a very different world . Thanks for adding your insight! Always had a strong family connection with the Navy myself too and I went to college in a naval city.